Identification: Very small; tailless. 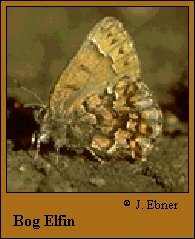 Upperside of females brown; males have more orange. Underside of hindwing has a reduced or obscure pattern and the outer margin is frosted with gray. Life history: Adults fly around the treetops. First-stage caterpillars bore into pine needles and feed from the inside; older caterpillars eat needles from the outside. Flight: One brood from mid-May to early June. Caterpillar hosts: Black spruce (Picea mariana). Range: Eastern New Hampshire through coastal Maine north to New Brunswick. Isolated populations in eastern Ontario, southern Quebec, and Nova Scotia. Management needs: Maintain integrity of bog habitats.